1. In a skillet, crumble and cook sausage and ground beef over medium heat until brown. Remove from heat and stir in spaghetti sauce and Steve's Pepper Sauce. 2. In small bowl, combine ricotta cheese and Italian seasoning. Preheat oven to 375째F. Spread 1 1/2 cup sauce into bottom of a 9 x 13 inch baking dish. Top with 3 noodles. Cover noodles with 1/3 of ricotta cheese mixture, 1 cup of mozzarella and 1 cup sauce. Repeat layers two more times. Add last 3 noodles. 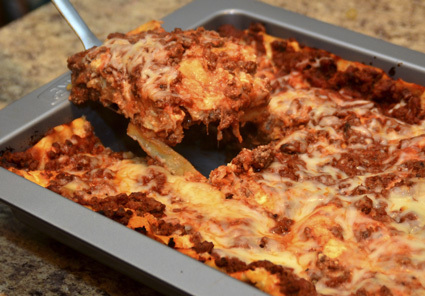 Top lasagna with remaining sauce and with remaining mozzarella cheese. Sprinkle Parmesan over mozzarella. Variation: I like to add pepperoni for another layer of flavor.